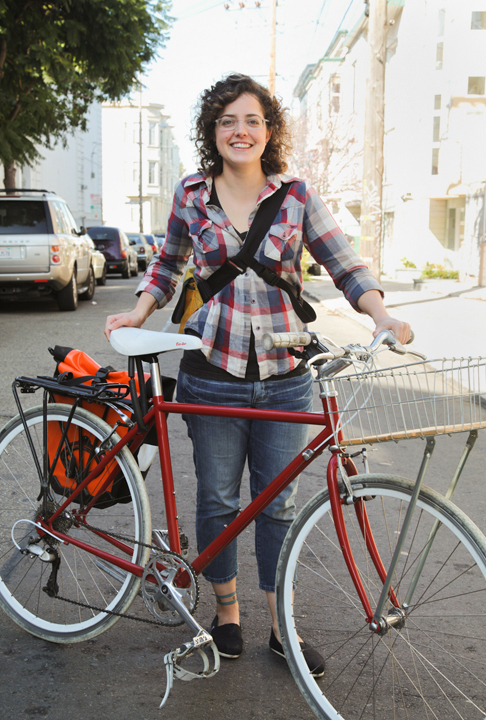 From 2009-2011, Natalie Glazer ran Bike Basket Pies, delivering small-batch hand-held sweet and savory pies by bike to San Francisco doorsteps. Having had thoughts for a similar biked baked-goods venture, and being intrigued by her adorable Bike Basket Pies recipe zine (see #2), I was interested in learning more. I got in touch with her and we had a nice phone chat about her pie baking, business, and what happens (at least for her) when a hobby turns into a job. Natalie learned to cook from her dad, but first entry-point to baking was via boxed caked mixes--now a far cry from her pies, which were baked from scratch with organic, local, and seasonal produce sourced from her backyard, friends' gardens, and San Francisco farmers' markets. She started specializing in pies about three years ago, having been inspired by friends' curry and crème brûlée carts. She said, "It was a very DIY and convivial scene. I had two jobs at that point but neither of them were particularly fulfilling so I decided I would start a little pie stand in the way that they had a curry cart and a crème brulee cart and I sold pies in the park once or twice on weekdays. "It turned out, though, that most of her friends worked during the day, and as much as they wanted to, couldn't make it to the park for lunch break pies. A friend suggested that since she traveled by bike anyway, she deliver to his office. He organized a bulk purchase amongst his co-workers, and Bike Basket Pies was born. Having outgrown her home kitchen, Natalie bartered for time and space in a restaurant, set her alarm clock to midnight a few days a week, and baked through the night in order to pedal pies to the doors of hungry San Franciscans in time for lunch. Her menu boasted both sweet and savory options with some very tempting combinations, including potato, leek & cheddar pie, shaker orange, and apple kiwi. As Natalie's business grew and she moved to a different kitchen, upped her hours, and gained quite a local following (just look at her yelp reviews). She said that one of the best part of the business was her interaction with customers. "It turns out that the people who got pie delivered were very good, generous people in the first place. They know they are getting a unique, handmade product so I think that yields some interesting people." In the end the work proved too overwhelming for a one-woman operation. She reflected, "Ultimately I’m really glad I pursued my passion, but it turns out for me at least, turning that hobby into a job was not what I want to do forever.It didn’t fit for me and obviously other people should follow what they want to do, but for me it turned baking from something that was about the process to something that was entirely about the results." Though Bike Basket Pies was a thriving business, I think Natalie's experience highlights the difficulty of running a small handmade food business and the difficulty in balancing work with pleasure, particularly for someone with diverse hobbies and career paths. Still, her risk, work, and success are undoubtedly inspiring. Though she's now moved on to another food-related project--working on an organic farm in Italy--Natalie commemorated the close of her business with a fun recipe zine, making her handheld pies available to everyone, as long as your up for baking them. If you live in San Francisco, you can pick them up at a handful of bookstores. Otherwise, you can get it as an iphone app or you can place your order online, which Natalie will gladly fill when she returns from Europe in August. You can also check back here--I'll likely be trying my hand at a Bike Basket recipe (cherry pluot pie, perhaps?) very soon.